Since writing this post, I had a slight change of heart regarding rose hues. Rather than search for that perfect one, why not collect them all instead. The idea of collecting all of anything is potentially dangerous, of course. I'm already knee-deep in makeup without this new resolution (which now sits snugly by "own the entire Le Metier de Beaute counter"), but what will beauty bloggers be without the sniggering devil on our shoulders? On to le rose! I snagged the last bottle of Le Metier de Beaute Magic At Dusk Nail Lacquer ($15) from the Bergdorf's counter recently. Magic At Dusk's formula is on the sheerer side. One coat gives you (the nail equivalent of) a light flush; at two coats I could still see the whites of my tips peeking through. Application is top notch as per LMdB usual. Update: Magic At Dusk is still be available on the Bergdorf Goodman website (it is currently incorrectly labeled as Noble Passion. You will see that the swatch color for Noble Passion is actually Magic At Dusk). Note: From what I hear, the current Le Metier de Beaute nail lineup will be discontinued after the next season to usher in larger sized bottles. Stock up soon if any of them are your must-haves! Purchasing from online retailers: The Summer Collection colors are priced at $10, whereas all other nail lacquers from previous collections are priced at $15. Purchasing in-stores: Based on my experience in Neiman Marcus Boston (and reports from other bloggers), it seems the nail lacquers from previous seasons are now priced at $10. The above in-store pricing does not apply to Bergdorf Goodman. As a reminder, Bergdorf's carries an exclusive called Lavande, which is priced at $18. 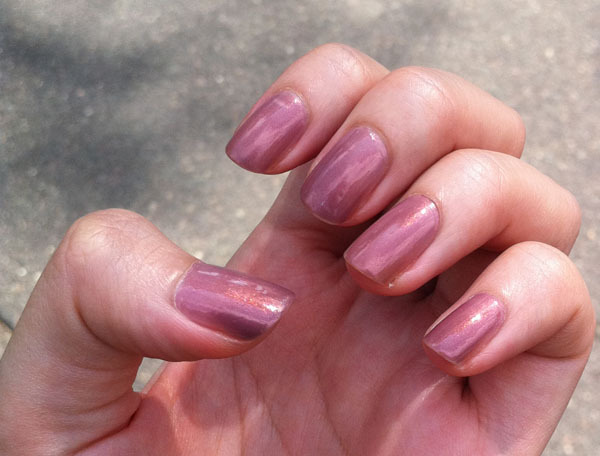 Speaking of rose nails, take a look at British Beauty Blogger's sneak peek to Butter London's A/W 2011 Collection. Needless to say, in my mind I already swiped my card for Toff. Oh that color is so gorgeous. I love the small packaging, but it's so expensive. It is probably going to be more expensive when they bring them back. wow such a lovely colour a must have! love this color! and I love your writing by the way, it's always very funny. What I beautiful color. Rose with a hint of ... lilac? I have been eyeballing it on the NM web site for a while, but their swatches are utter crap, so I am grateful for your post. I will have to order it now. Oops, already sold out at NM, and it was just there a couple days ago. I can't justify BG shipping, which is more than the nail polish. Oh well, I will have to admire this one from afar. I also have every intention of owning the entire Le Metier de Beaute counter! @Zuzu's Petals :(( I wish BG did free shipping!